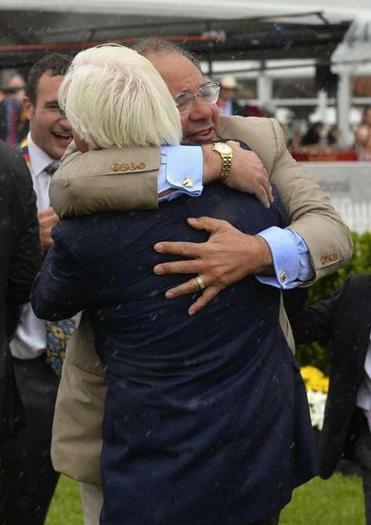 Ahmed Zayat embraces trainer Bob Baffert after American Pharoah won the Preakness. Ahmed Zayat’s Triple Crown dream has vaporized so often in the past that this one has felt like a fantasy ever since American Pharoah crossed the line first in this month’s Kentucky Derby. “No more seconds,” the native Egyptian owner declared after one of his entries finally won a blanket of roses. Three times in four years a Zayat Stables thoroughbred had been runner-up at Churchill Downs and another favorite — Eskendereya in 2010 — was scratched at the beginning of race week. In 2012 Zayat’s horses finished second in all three legs of the Crown. Across the river from his New Jersey headquarters in Hackensack, the financial players say that the most foolish phrase is: “This time it’s different.” Since Affirmed won the Triple Crown in 1978, 13 3-year-olds have claimed the Derby and Preakness only to come to grief in the Belmont, including the scratched I’ll Have Another in 2012 and most recently California Chrome last year. The 52-year-old Boston University alumnus has been involved in the highest levels of thoroughbred racing for a decade and has had his share of nightmares. Five years ago his stables went through bankruptcy in the wake of a lawsuit by Fifth Third Bank, which claimed that Zayat had defaulted on $34 million in loans. And a federal lawsuit by a felon who says that Zayat owes him $1.65 million for bets placed for him with an offshore bookmaker recently re-emerged, diverting attention from the Triple Crown quest. This has been a springtime of reinvention and redemption for a Cairo-born Jew who made his fortune selling nonalcoholic beer to Muslims. Zayat, who grew up in a wealthy suburb and whose father reportedly was former president Anwar Sadat’s physician, learned about horses as a young show jumper. While he came to America for college, he didn’t attend Harvard, as his stables’ website once said. After graduating from Yeshiva, Zayat received a master’s in public health from BU and went to work for Zev Wolfson, a wealthy New York real estate developer and investor. Zayat’s big break came in 1997 when the Egyptian government privatized its moribund Al Ahram beverage company and Zayat and a group of investors outbid Heineken and Budweiser. Zayat turned the company around, introducing new products such as Fayrouz, a blend of malt, fruit, and sparkling water that provided fizzy satisfaction without an alcohol kick. In 2002 he sold Al Ahram to Heineken for $280 million, the largest business blockbuster in the country’s history, and stayed on for five more years as the company’s chairman, commuting to New Jersey on weekends to see his wife and four children. By 2005 Zayat had plunged into the equine game, spending $4.6 million on a Keeneland yearling that he named Maimonides, after the medieval Jewish philosopher and scholar. A year later he paid the top price at the Fasig-Tipton sale at Saratoga, putting up $1.6 million for a filly named Mushka. Zayat, who has described himself as “an all-in guy,” immersed himself in the art and science of buying, breeding, and racing elite quadrupeds and became America’s Leading Owner in 2008 when his entries won 116 times in 740 starts and earned nearly $7 million. A year later he had his first Derby downer with Pioneerof the Nile, who was beaten by Mine That Bird, a 50-1 shot who came out of last place to win by nearly 7 lengths, the biggest margin since Assault in 1946 with the biggest payoff since Donerail in 1913. Thus began four years of May misfires. In 2010 Eskendereya developed leg swelling, was withdrawn on the Sunday before the race, and never competed again. In 2011 Nehro ran second to Animal Kingdom, a 21-1 shot who hadn’t raced in six weeks and had never won on dirt, a Derby novelty. Then, in 2012, came the triple whammy. Bodemeister, a 4-1 favorite who’d led from the start and was 3 lengths ahead at the top of the stretch, was run down in the final furlong by I’ll Have Another, a 15-1 rival who won by a length and a half. Bodemeister again led from the start at the Preakness and again was overtaken by I’ll Have Another in the final furlong, this time by a neck. At least Zayat was still in the running after a nasty tiff with Fifth Third Bank, which accused him and his company of “fraud, dishonesty, incompetence and gross mismanagement.” Though his stables had earned $23 million in purses since its formation, Zayat was caught in a cash squeeze as the equine market was crashing after he’d bought his horseflesh at the top of the market. Zayat’s firm emerged from Chapter 11 reorganization that summer, agreeing to pay the bank and other creditors in full. His stables since have flourished and Zayat has worked with fabled trainers including Baffert, D. Wayne Lukas, and Todd Pletcher. Finally this year he has the horse of his fantasies, the son of Pioneerof the Nile and Littleprincessemma, who is named after Zayat’s daughter. While this year has been magic it hasn’t been without moments of meshugas, most notably in the Derby where American Pharoah was third after a mile and had to battle down the stretch to hold off Firing Line by a length. That prompted weeping in the owner’s box and upchucking from Justin, whose nerves were frazzled. This week around the barns and barrooms, the talk is more likely to turn to whether American Pharoah is the real deal or another hyped-up fable that can’t pass Belmont’s demanding mile-and-a-half “Test of the Champion.” Based on the first two legs Zayat already has sold the horse’s breeding rights to Coolmore Ashford Stud in Kentucky for an undisclosed sum that is believed to be significantly in excess of $20 million and that will be increased if the horse wins the Belmont. If American Pharoah can hold off as many as nine rivals on Saturday he’ll not only make history, he also may be a messiah for a sport that has needed one for decades. “The sport without a star is not a sport,” Zayat said.